I love learning and that’s why I write novels. I’m not talking about research. I’m talking about the process when I sit down to write and empty my mind of everything I’ve ever known in order to make space for stories to emerge from within me. That’s when the real learning happens. It’s at these moments that I gain insights into my unconscious and by extension into our human condition. I’ve completed my first novel at the age of 34, my second at 37, my third at 41 and my fourth at 44. That was Magda – the first novel to be published (by Salt in 2013). In retrospect I’m pleased that I had to wait for over ten years and four novels to find a publisher. Not because the three unpublished novels were bad. Of course I shed many tears of frustration when I received rejections. But my inability to find a publisher forced me to reflect on why I write. Did I write to achieve outside acknowledgement? If so, I was failing. And I don’t like to fail, I’m ambitious. Still, after each ‘failure’ I would pick myself up and write another novel, working on it until the story was complete and I was satisfied. With each finished work I honed my skills. I also found a trusted first reader and editor. But still I didn’t get published. Then in 2008 I started to run Peirene, my own publishing house that specialises in translated literature. For a while I was thrilled. I finally had found a way to be successful and gain outward recognition. Peirene enjoyed a flying start, and I thought that perhaps at heart I’m not a writer but a publisher, and that being a publisher would fulfil all my creative needs. So I stopped writing for nearly a year. I still remember the moment when I realised I had made the wrong decision. My husband and I were on holiday on the island of Islay. I was sitting in the car, he had popped into a shop. The sun was dancing on the glittering sea. I was listening to the radio and I heard the newsreader announce that the French-American artist Louise Bourgeois had died that morning at the age of 98. Louise Bourgeois is one of my creative heroes. I first encountered her sculptures and installations at an exhibition in Paris in 1995. Since then I have seen many of her shows and have read everything by and about her I could lay my hands on. I wasn’t shocked or saddened by the news of her death. After all she was nearly a hundred. It was more to do with a clear and calm realisation I suddenly experienced there in the car: this woman had never given up. She kept on working till the very end. Creative writing – like everything else in life – has to do with practice. Not only do you improve your skills and techniques by doing it day in day out, but you especially learn to recognise, handle – and even collaborate with – your fears and anxieties and become apt in accessing the ‘zone’ despite your super-ego trying to sabotage you. Word after word after word. Hour after hour after hour. In my experience the 10,000-hour rule not only applies to learning musical instruments or sport but also to writing stories. Unless you are a genius, which I’m not. I had already put in thousands of hours – and probably written a million words – in order to exercise the creative muscle. Was I really willing to let all of this go? By the time my husband returned to the car, I knew I would have to be both: a publisher and a writer. After our holiday I began to write again. This time, however, it was easier. A weight had been lifted from my shoulders. By running Peirene I had understood one important lesson in publishing: the quality of writing has little to do with the success of a book. I only publish books I absolutely believe in. They are of high literary quality and have something to say. My authors are award-winners in their own countries, but they have never been translated into English before. And yes, Peirene is successful, but only within its niche of literary fiction and our sales figures do not come remotely close to a Fifty Shades of Grey. Furthermore, most Peirene books have been rejected by major UK publishing houses. Not because they are of bad quality, but because they wouldn’t sell enough copies to keep a big company afloat. The nagging feeling I had still harboured in the back of my mind – I’m a bad writer and that’s why I’m not getting published – evaporated into thin air and made room for a more constructive thought: As long as I’m satisfied with what I produce, I have achieved my goal. The rest lies out of my control. I sat down to write Magda. Afterwards I wrote Clara’s Daughter, which Salt published last year. And now they are bringing out Kauthar. I write short novels, under 200 pages. The first draft is usually three or even four times as long. Then I cut, edit, rewrite. My starting point is always personal – a vague feeling and an image. I write in order to explore. Each story turns into a journey, a search for something I know I cannot express in any other way. Louise Bourgeois once said: “You do not make sculpture because you like wood. That is absurd. You make sculpture because the wood allows you to express something that another material does not allow you to.” I believe the same is true for story writing. I use plot, voices and structure to give shape to an emotion I can feel but not grasp. For Kauthar, the seed was planted in my head way back in 2005 when I saw a news headline about a Belgian woman who had become a suicide bomber in Iraq. She was born in 1967 – the same year as me. This fact caught my imagination, especially as I had been drawn to Islam while I was studying Arabic in my early twenties. So what had gone wrong with the woman that she misused her religious faith to commit a crime? To understand – in emotional and psychological terms – I had to imagine (on paper) becoming a suicide bomber. But I had no idea why I felt compelled to put myself through this experience until I had finished the novel. Kauthar became a story about a woman who doesn’t understand the compromises love requires of us – whether the relationship involves a parent, a lover, a friend, a god. No one can give us perfect love. I never saw that clearly until I had written Kauthar, and maybe that is something I had to learn. To balance writing and running a publishing house can of course be a challenge. Both require a lot of time and in many ways each requires opposite skill sets – running a company relies heavily on the organising capacities of the brain’s left hemisphere while the creative process requires a connection with the free-flowing right hemisphere. Sometimes I can literally feel the friction as I switch from one side to the other. However, both activities benefit from each other. As a writer I owe a debt to the Peirene authors: Veronique Olmi for her courageous portrayal of a woman who commits an unforgivable crime; Birgit Vanderbeke for handling an important historical moment from a personal angle; and any number of others for teaching me the power of compression and strong voices. Moreover, I now recognise that publishing a book requires a team effort. You have to allow other people to contribute. 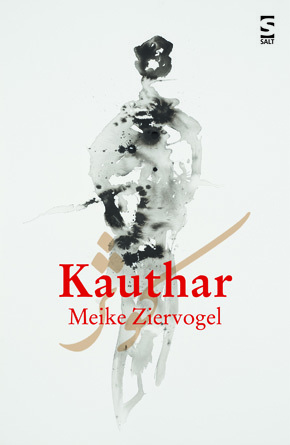 Just take a look at the stunning cover of Kauthar. The artist Whitney McVeigh, the designer Sacha Davison Lunt and the people at Salt turned the book into what it is now. Running Peirene has demystified the act of publishing and taught me the importance of marketing literature well. As a publisher I have learnt to trust the creative process without losing focus. When I set up Peirene many people told me that concentrating on translated literary fiction of under 200 pages would be commercial suicide. I held onto my vision and we found a way to build a community of trusted readers – through our salons, pop-up stalls, subscriptions and literary newspaper. I have an image in my mind. If I had lived 200 years ago I would be a woman in long woollen skirts and a shawl over my shoulders, walking along dusty roads from village to village. I would gather people around me and tell them stories – some that I learned by heart from elsewhere and others that I made up myself. And from the villagers themselves I would learn new stories. I don’t think much has changed just because I live in the 21st century. 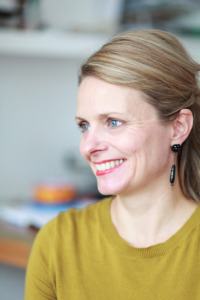 Meike Ziervogel is the founder and director of Peirene Press. Her debut novel Magda was shortlisted for the Guardian’s Not the Booker prize, and nominated as a book of the year 2013 in the Observer, Irish Times and Guardian. She lives in London with her husband and two children. Magda, Clara’s Daughter and Kauthar are published by Salt. Read more.